Since I installed Leopard, the Dock’s Downloads folder has become my computer’s lost-and-found department, collecting all my stray Web links, orphaned photos, and errant PDF files. Dejal Systems' Caboodle seemed ready to offer all those random files a neat and orderly home. Unfortunately, Caboodle’s odd, sometimes frustrating ways didn’t live up to its terrific concept. The program’s admirably simple interface is easy to grasp from the first launch. A navigation bar on the left of the program window lets you create lists of custom categories—the program launches with several examples, including recipes and serial numbers. You can then populate those sibling categories with child entries. For example, a “Recipes” category could have subcategories for entrees, breakfasts, and desserts, each with its own list of dishes. Each new entry begins as a TextEdit-like window for jotting down notes. In addition to basic text formatting options, buttons on the toolbar open complex but useful menus for creating simple bullet-pointed lists and tables. Caboodle lets you drag and drop a variety of files into each blank new entry, including images, HTML pages, PDFs, Word documents, and videos. If it can’t read the files itself, it’ll create an alias linking to a program that can. Caboodle can display photos and PDFs and play videos, with a full PDF reader and Safari-style HTML rendering planned for future versions. But I couldn’t resize huge images or awkwardly sized clips to more viewable dimensions. 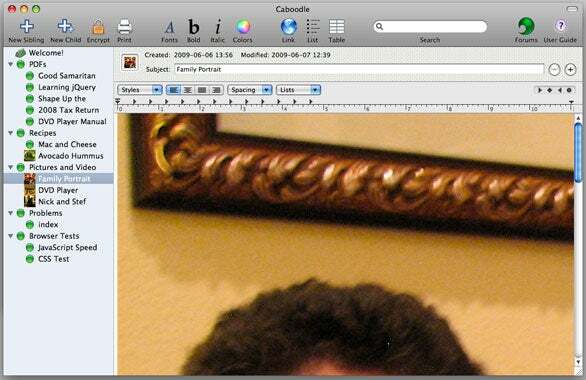 Caboodle can display photos, but can’t shrink huge images down to an easily viewable size. Though most documents, including Word files, imported flawlessly, I initially had trouble moving HTML files into Caboodle through the Import command in the program's menus. Within hours of being queried about the bug, programmer David Sinclair responded with a new build of the program that fixed the problem (version 1.3.1, now available from the company's Web site). Unfortunately, an attempt to export a text file to HTML yielded bad formatting, with a list’s bullet points spilling over into subsequent table cells. Sinclair said this is a known bug; his suggested workaround, exporting the file as a Web Archive instead, worked fine. Caboodle also tends to grow increasingly sluggish as you add more entries, hanging for several seconds after each new entry is created, and sometimes taking a short while to display even simple text entries. According to a post from Sinclair on Caboodle’s excellent online help forums, the program’s current version has to re-account for every single entry every time a new one’s created; a future version will fix this problem and speed things up. Caboodle touts the ability to add custom icons to categories and entries, but again, using this feature doesn’t feel as simple as it should. Copying or dragging image files into a designated “well” at the top of each entry yields tiny, hard-to-distinguish icons. And when I tried to copy and paste an icon directly from a file’s Get Info window in the Finder, Caboodle gave me a blank icon instead—the result of incompatibility between the Finder, a Carbon app, and Caboodle’s Cocoa underpinnings, Sinclair said. A basic text editor lets you create bullet-pointed lists and tables within Caboodle entries. The program is well integrated with Mac OS X’s Services menu, letting you send highlighted text or selected documents straight to Caboodle from other programs, or pipe content from Caboodle into Mail, Safari, or other Services-friendly apps. It’s also easy to securely encrypt entire entries or individual categories, and Caboodle gives you the welcome option to view encoded files without fully decrypting them. Caboodle has no Mac OS X help files, but does link to its handy forums and a useful online guide. With such a great, useful concept behind it, it’s a shame that Caboodle 1.3 ends up feeling so much like a work in progress. It’s less expensive than many rivals, but offers fewer features and less polish along with its lower price tag. Sinclair’s clearly working hard on the program, and his attentiveness to customers’ concerns deserves applause. But until he can squash some of Caboodle's bigger bugs, the program's hassles can’t quite justify even its relatively modest price.